I’m not sure if I feel like celebrating .. or breaking down crying over the fact my baby girl is not at all a baby anymore. “I got my first zit,” she excitedly tells the Cowboy over the phone last night. I’m not even sure we’ve shared that yet with her dad. I hope so, though. Because in a very weird way, it feels like that is a major milestone. And I know she’s been on the phone with him at least a couple times in the past 24 hours. I tell her we’ll get her some things so that she can start taking better care of her skin and face. This discovery comes not long before we head out the door. And because we had some time to kill before going to a movie .. we stopped at the mall. I haven’t gone for myself in a very long time, so I was curious to stop in a few stores that I used to like to frequent. See what might be new for spring. And while I didn’t see anything that appealed to me, my daughter did. 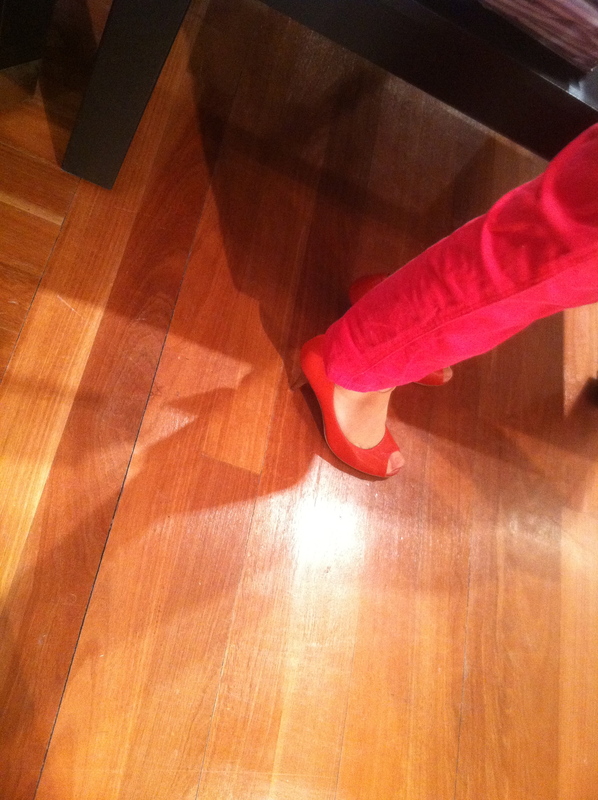 Not little girls shoes ..
“Is it okay if I try on this pair of shoes?” she asks of an adorable pair of red kitten heels. I didn’t think they would actually fit her. Last I knew she was maybe a size 4 shoe at best. And measuring below my shoulders. What happened in the past week? “C’mon.. let’s go,” I say. A bit flustered at how much she’s grown. “Mom….” she says as she sees a coat on the way out she really likes. She asks me to hold her jacket while she takes off her ski coat and tries on a misses black leather jacket with a fur collar. “I LOVE this jacket, mom,” she says. Great, I’m thinking to myself. It’s all part of a wonderful series of changes happening right now. Changes she is celebrating and wanting to talk a lot about. Very different from what I remember wanting to do when I was growing up. I dreaded any changes. Rarely were those things talked about when I was a child. Not at home. And not amongst friends. Or relaying to the world. Especially a zit. A day late because my girl who is growing up .. crawled into my lap late the other night as I sat on the couch catching up on the video phone with the Cowboy. After sharing the big news about her zit, and hanging up to go put her back to bed.. I decided, it wasn’t much longer she’d want to curl up on my lap, or that I could hold her. This entry was posted in Life, Love, Parenting, South Dakota, Tweens, Uncategorized, Wisconsin and tagged Children, Cowboy, Family, Fashion, Life, Parenting, South Dakota, Teens, Tweens, Wisconsin by Carleen Wild. Bookmark the permalink. Your daughter will go through a time when she only wants to sit in your lap when ‘she’ wants to. Then she will come back to you and want to still crawl into your lap. All 3 of my daughters have done that. Your relationship with them will change but still have times where they come back to being your little girl. At times they will challenge you in ways no one else can—-because they know you like know one one else does, especially if your mom is not here on earth and your not married to their father anymore. But then you can do the same with them. There is a deep love there that only can develop through time. Enjoy all the moments with her. I remember each of my girls getting their first bras!!! That was the moment for me!!! It still brings tears to my eyes. The best part though that I love and secretly still love, is watching them sleep. So precious a gift from God!!!! There is such an innocence there that you just want to bottle!!! Thank you for sharing this and bringing back those very special moments with my daughters!!! I think I’ll call them all right now. One of them ‘may’ want to talk to me right now! LOL! love you Deanna.. thank you for the thoughts. you always give me perspective and are such a dear friend. hope the girls answered.. give you a call later today.